This is the fourth post in the Thailand! travel series of my eats in Bangkok. Other posts include Thip Samai, Best Pad Thai in Bangkok?, Raan Jay Fai, Best Drunken Noodle in Bangkok?, and Maeklong Railway Market. Bangkok used to be a city of canals. Anchored by the Chao Praya River, the city’s intricate system of “khlongs” (or canals) served as the main channels of transportation. More than that, the canals also handled the sewage for the city, as well as house many floating markets. As time went by, more and more canals in central Bangkok were filled in to make way for new roads. King Rama IV built the first road in Bangkok in 1861 in response to Europeans asking for a place where they could ride their horses and carriages. As canals disappeared, so did the floating markets. 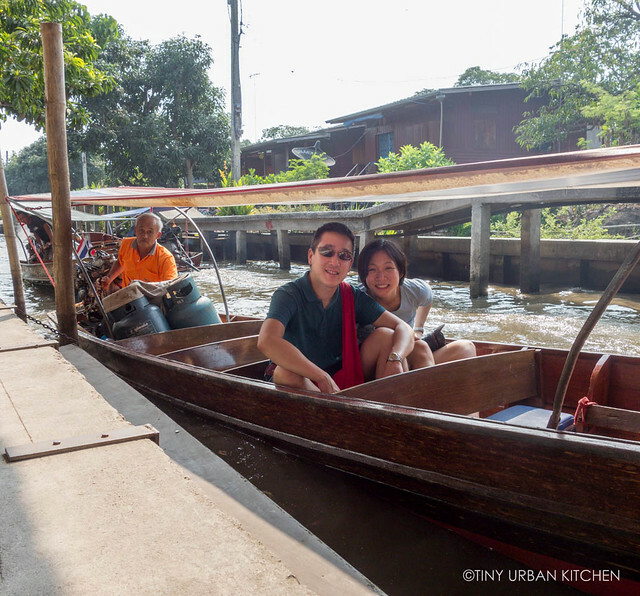 Today, one must travel to the outskirts of Bangkok to see a floating market. Many of these exist more to serve the tourist than the local community. Nevertheless, it’s still fun to visit and definitely a fascinating glimpse into a way of life that is becoming quite rare. The most famous (and probably largest) floating market near Bangkok is called Damnoen Saduak. This market is about 100 km away from Bangkok. You can take bus 78 from the Southern Bus Terminal in Bangkok (takes about 2 hours and costs just a few dollars USD) or hire a driver for the day (our driver charged us about $80 USD and was willing to stop at multiple locations, including the Maeklong Railway Market). Perhaps the best way to enjoy the market is to stay at one of the local inns the night before. This allows you to visit the market in the wee hours of the morning, well before the tour buses arrive around 9AM. We didn’t have the luxury of time (our plane was leaving that evening! ), so we could only afford a half day morning trip to the market. One common way in which the market makes money is that most buses, taxis, etc drop you off at a location that is still about 1-2 km away from the center of the floating market. There are motorized tour boats at this location which charge hefty prices clearly aimed at tourists (anywhere from $30-$100 USD quoted for a 1-2 hour tour of the market). Women holding clipboards will approach you as soon as you get out of your car, offering you a price for the boats. At this point, you can choose to walk the 1.5 km to the entrance, thus avoiding the high prices for the boats. I’ve also heard there’s a bus that goes to the entrance, but I did not seek it out. Or, you could just pay for a boat, which is what we did. Bryan and I tried to bargain, and got the price of the boat “tour” down a bit (we bargained her down from 1200 Baht ($40 USD) for 1 hour ride to 1000 Baht ($33 USD) for a 1.5 hour ride). It’s still a lot more expensive than trying to get to the center of the market by foot, but we were short on time, and I didn’t think it was worth wasting the time walking to the entrance. Plus, that initial boat ride through the canals into the market was actually quite fun. I love boat rides in general and I thoroughly enjoyed seeing the water-side homes and other sites on both sides of the canal. Plus, I appreciated the less crowded parts of the market that our boat driver took us to visit. Here is a covered area of the market. There are fewer boats, but also fewer tourists. To be honest, I think it was the most authentic part of the entire tour. This is where we saw local people cooking up the most incredible dishes inside the boats. Isn’t this lady’s boat pretty awesome? She has multiple large pots, dishes full of “toppings”, and piles of porcelain plates behind her. This woman had a hybrid operation going, sitting on the edge of the dock while cooking on a floating boat. I loved the calm serenity here. And don’t you just love the gorgeous colors of all those tropical fruits? As we moved closer to the center of the market, we began to see more and more boats going up and down the canals. At times, it would get so crowded with tourist boats there would be “traffic jams” in the middle of the canal. Some people found this annoying, but I just found it hilariously amusing. Aside from the boat vendors, there were also lots of “land” vendors on each side of the canal. If you wanted to buy something, the boat driver would stop at the “shop” and you could purchase stuff. Prices at these shops were generally significantly higher than the prices at the normal outdoor markets in Bangkok. After all, this is a place aimed at tourists. Thankfully, the price of food wasn’t too bad, though it’s still worth bargaining. Here I am buying mango sticky rice from a boat vendor. It was quite tasty, though probably not the best mango sticky rice I had in Thailand. The prettiest boats were the ones that were filled with brightly colored fruits. There were boats dedicated to bananas, rose apples (above), dragon fruits, and rambutans. You could also buy beer all over the place. Bryan bought his first can of beer for $3USD, which he thought was pretty cheap. “How much was the beer?” asked our boat driver after Bryan paid. “100 Baht” I said (30 Thai Baht is about $1 USD). After that, our driver kept bringing us to other beer vendors who sold ice cold beers for only 50 Baht. I bought a fun Thai snack that sort of looks like a taco but is sweet. After taking many photos and videos, our 1.5 hour tour was up and it was time to go back. I hadn’t really bought anything except food, which was totally fine by me. My biggest aim in coming was to enjoy the unique experience, take tons of photos, and sample some fun snacks. If you’re looking for an authentic, traditional market experience, this won’t quite satisfying you. As I said before, things have become quite tourist-oriented at this point, and a trip here may feels more like a theme park visit than a true glimpse back into the traditional Thai life. However, even if it’s touristy, it’s still fun. I loved having our own private boat (with driver) take us around the many canals in the area. Damnoen Saduak is definitely a huge market, and there are tons of opportunities to see all kinds of vendors. If you want, you can even venture off the beaten track and ask the boat driver to take you away from the market to explore some of the other canals. As a person who is passionate about photography, this visit was a dream. There are so many photo-worthy shots, it’s hard to stop taking pictures. For the photos, come early in the morning when the sun is better situated and there are less tourists. Remember to pick your shutter speed carefully! Our boat was moving quite fast, and some of my pictures turned out a bit blurry if I wasn’t careful! If you have some extra time in Bangkok, I would recommend at least visiting one floating market. It’s a fun, relaxing, and different sort of destination compared to the hustle and bustle of Bangkok. However, if your time is short (e.g., just a weekend in Bangkok), I would skip traveling the 100km to get here and instead focus on all the other cool things Bangkok has to offer. Have an itch to travel after reading this post? How about visiting Greece? Visit the famous Parthenon in Athens and the gorgeous island of Santorini. For something a bit more unusual, take time to visit Zante’s famed Blue Caves. I was wondering what’s up with the random link to “Zante’s Blue Caves” at the end of the post? Did you start a new partnership with that travel agency? Btw I’ve been enjoying the pictures in this series so far.